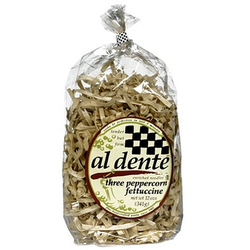 shop Al Dente Three Peppercorn Fettuccine 6x12Oz | bargainbrute. Enjoy Al Dente Three Peppercorn Fettuccine. Thin Ribbons Of Egg Pasta Made With Three Kinds Of Cracked Pepper. (Note: Description is informational only. Please refer to ingredients label on product prior to use and address any health questions to your Health Professional prior to use.